Francis Irving: Hello! 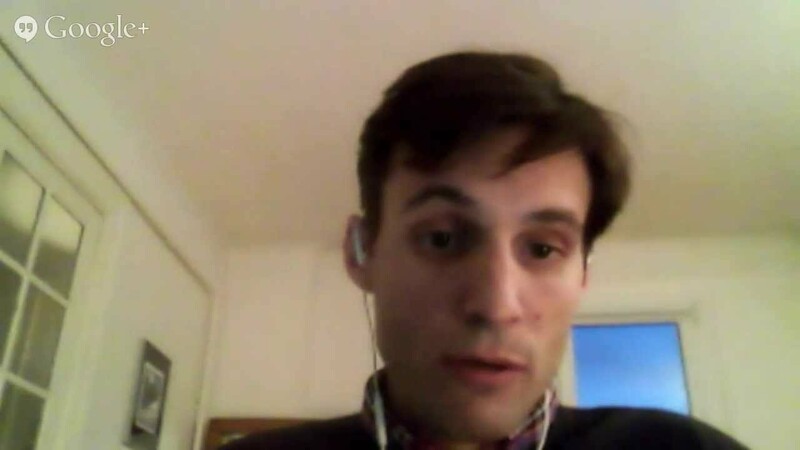 Welcome to a Redecentralize interview with Benjamin André from Cozy Cloud. He’s in Paris, France. Hello Benjamin! Benjamin André: Hello! How are you? Francis: So can you tell us a little bit about Cozy Cloud? What does it do? Who’s it aimed at? Benjamin: Cozy Cloud is your personal cloud, your private home server, on which you can have all your personal data, and also your own web services running on your personal cloud. So the idea is to make it very easy for anyone to administrate his personal cloud — as easily as his smartphone. And then you can have your whole digital life on your personal cloud. Francis: So what kind of things does it let you manage? Is it stuff like calendars and files, or what sort of stuff? Benjamin: Yes, exactly. All the classical basic data, like the ones you mentioned. But you can also have your bank account details. For instance, today we can get your data back from 22 banks. You can have your data from your quantified self devices such as your scale or your watch, or your Jawbone or Fitbit device. It can be absolutely any kind of data, and what is interesting is that Cozy makes it easy for apps to share the data between them, so that you can. . .
Francis: Oh, so people write applications on top of Cozy Cloud that do different things? Benjamin: Yes, yes. Cozy is free / open source, and each app is a fully autonomous web app on an HTTP server in Ruby, Python, Node.js — for now we are only Node.js compatible but we are working on Python — so you can develop your own app with your own language with your own framework, and you can deploy it easily on Cozy. Maybe we could make a quick demo to show you a little. . .
Francis: Yes! Yeah, I’d love to see what it looks like. Yeah, go for it! As a user, how do I. . .
Benjamin: So here — you should see my screen — this is the login of your personal cloud, of your Cozy instance. So you can of course enter your. . .
Francis: So just to clarify — this is on cozycloud.cc, so that’s like a hosted version of the open-source Cozy software. Benjamin: Yes, exactly. Exactly. But the UI is personalized because it can be hosted on your own hardware at home, or it can be hosted on a machine you hosted by your hosting company, such as Amazon or Rackspace or OVH. And you deploy it, and then you can administrate by just logging in to your server. Then you reach your home, from where you have access to the services you have deployed on your Cozy. Francis: Oh, so the app store is much like a mobile phone app store; it has lots of programs on it. Benjamin: Yes, the paradigm is very close to the Play marketplace of Google, but an important point is that it’s not a compulsory way to deploy an app. You can deploy an app just by giving the GitHub URL of your app, and then it will be deployed on your Cozy. The marketplace is more an easy way to find and to share apps than a compulsory point. Benjamin: So, for instance, to illustrate the fact that your apps are sharing your data — I like the note-taking app, because usually in a note-taking app you can only add text. Here your notes can access your contact list, so you can have an auto-completion on your contact so that you can insert a reference to any of your contacts. And you could tag your photo with the same contact, because in any app your contact will be everywhere the same — you don’t have the contacts of Gmail and the contacts of Facebook. Francis: Oh, so Cozy actually notices you mention the name of another person and then indexes that in some way. Benjamin: Yes, exactly. You can say also that you can insert a task into your note, for instance ‘Call John Coltrane’, and you turn your line into a task. So this is a check box. And then if you go into another app, which is the to-do app — an app which is developed by someone who doesn’t know the developer of the note-taking app — then you have your task available in your other app. And if you check your task in your to-do-list then it is updated in real time in your note, because even if developers don’t know each other, they are working on the same set of data and they are integrated. You don’t need to be in a walled garden, in a silo, in a Google silo or a LinkedIn silo, and your apps are collaborating. Francis: Okay. What kind of standards do you use to base this off of? So if I, for example, wanted to access the calendar on my smartphone, is there a version of it that I can run on Android or FirefoxOS, or does it use a protocol to sync to that, or how does that work? Benjamin: Yes, of course. So we are compatible with WebDAV and CalDAV so that you can synchronize the calendar of your Cozy server with, for instance, your iOS phone or your Android phone, but there’s always Thunderbird, or even with Google’s Gmail, of course. Francis: And this is something that lots of people are using already or just the team is using? What sort of stage is it at? Benjamin: We are in a private beta for now, but we are quite close to an official release of our apps, and in the first quarter of 2014 we should have the contact, agenda, file synchronization (such as Dropbox) onto your server available. Francis: Okay. I’m really interested at the moment in the business models behind all these things, because I’ve seen from the last 10-20 years that what will win is what manages to get money to pay to improve it. So tell me a bit about what your plans are for how you’ll make money so that you can keep improving the product for the users. Benjamin: Yes. We have two kinds of business models. We have a short-term business model and a mid/longer-term business model. What this is is that we are — today we have clients from the mid- and long-term business model, and not yet for the short term. So I will start with the short term, which is easier to understand. For instance — I will share the screen just to show a quick slide, to explain that the project is in a kind of tendency where you have many different products working on having your own data on your own hardware, synchronized between your devices. It’s a huge tendency. And this summer OVH — OVH is the third-biggest hosting company in the world; it’s a very big company — they launched a new affair, a five-euros-per-month dedicated server. And they sold fifteen thousand servers in only ten days. So we presented Cozy to them and asked them, ‘Would you sell more servers with Cozy on top?’ And they said, ‘Definitely, yes!’ And they asked us for a commercial offer. And that is the starting point of our short-term business model. Francis: Would they pay you like a license fee to support that, or how does that. . .
Benjamin: Yes, exactly. The business model with them would be a fee per user, per month to provide them the whole infrastructure to manage a cluster of Cozy, because the Cozy in itself is open source, but the cluster controller that will deploy, back up, update, monitor all the clusters of servers is not open, and it is our business model. Francis: Okay, so somebody doing it on the scale they want would want it if they are having millions of instances. Benjamin: Exactly. So that’s the business model. That’s the first business model, in fact. Francis: Just to quickly ask — have you talked to people, have you got anyone at OVH you think would be interested in doing this next year? Benjamin: Oh yes, yes. They sent us a letter of intent to help us raising money for that purpose, and they involved us in many of their own projects, so we are working closely with them today and they are really excited about the idea of deploying Cozy onto their servers. But we have also other kinds of clients. We have some — for instance La Poste, which is the French postal company, and they are interested in selling some personal-data-storing services to our clients, and they are paying us to develop some features on top of Cozy so that they could figure out what kind of services they could sell. Those today are our clients. Francis: That’s like an ISP, is it? or a telecom company? Benjamin: Yes. In fact we have some telecom companies, but there are also some banks; all kinds of companies who are interested in developing new services on top of personal data. You can consider that those companies are before the web — their business started before the web — and today they are challenged by natural-born digital players, and they have some difficulties in finding their place with the web business models, and Cozy is an opportunity for them. Francis: Right, so if they just went and used like Google Apps or something, they would lose too much — all — their control I guess, whereas you. . .
Benjamin: Yes. They can offer services to their clients that can use all the data of their clients without having access to it. For instance, Société Générale, we are developing with them an app that people can deploy on their Cozy. And this app will provide a much more valuable service than Mint, or banking, [indiscernible] or any kind of service because they have access not only to the bank information, but also to the mail, to the agenda, to [indiscernible] geolocation, to the invoices — what Mint will never be able to do. Société Générale, they expect. . .
Francis: Can you just go back to your camera view then, for a minute. Yeah, okay. So far to get to this point, you’ve had some seed funding, have you, from people? Or have you got customers that are already paying? Benjamin: No, in fact we have customers. At the moment we are still self-funding. We are six full-time on the project, self-funding, and we have some clients to run the company, but we are starting fund-raising so that we can accelerate, especially to fulfill the requirements of OVH. Francis: Okay. And you were saying you’ve got a longer-term interesting model in mind. Was that the one you’ve already described, or was there another? Benjamin: Yes, the other business model is around the marketplace, because what’s interesting is to bring the business model of marketplace to the web services. Today on the web you can consider that there’s a lot of diversity, but in fact for each service you have only a few actors, a few competitors, whereas on the marketplace of your phone you have a lot of apps for any kind of usage. And the reason comes from the business models, and Cozy can bring the business model of marketplace to web services. And we definitely consider that it can be a way to increase the offer of apps, because it will bring money to developers. Francis: So that will be competing with things like the Chrome app store? Benjamin: Yes, but on your server, because you can deploy your service on your server, not on your browser or on [speaking simultaneously]. Francis: Oh, okay. So in a way the nearest thing is the ability on Amazon Web Services, where you can rent a server with an app running on it, but it’s hard for normal people to use. But yeah, it’s more like that? Francis: Okay, interesting, yeah. Fantastic! So what would happen if lots of people started to use it? And how do you see the world being if Cozy’s really successful? Benjamin: Well, the reason why it’s a very good prospect, not only for us I would say, but for the web, is that this approach would force, would oblige, the big web companies to be more respectful of the users regarding something like their privacy, but also to empower them with their own data. Today we cannot leverage the full power of our data because they are spread in many silos, and you cannot mesh up your data. And the problem will keep increasing with all the new devices, all the new sensors — each company will create its own silo and you cannot leverage the value of your data, and when a lot of people will have their own server we will no longer depend on the big guys from San Francisco, and they will have to modify their behavior. Francis: What’s your marketing plan, in terms of how are you going to get lots of people to care about this at all, and use it, rather than just carry on using the easy choices, using Facebook or Gmail? Benjamin: Yes, the good market is very important. Definitely we want to reach [indiscernible] I would say — anyone, but we consider that we must not try to evangelize the world, so we will use the traction of third parties and we grow step by step. So our first audience is the geek and the hacker, and our relay, our traction will be hosting companies, because those guys are already clients of OVH, and we will not sell them Cozy but OVH will sell to them. The second audience is more power users, people who are aware of what geeks do, but they jump into the new usages only when the service is mature. And then you can reach [indiscernible] because those people at Christmas go home and explain to their grandmother that they should forget Gmail and go on a new service. Francis: Do you remember the Spread Firefox campaign from, it was about 10 years ago now? Francis: It was when Firefox was new, and there was a fantastic crowd-sourced marketing campaign where they got everyone to market Firefox and tell all their friends about it. And it had lots of affiliate link schemes, and there was a big online community of people working out how to do it. So, yeah, I think what you said reminded me of that. Benjamin: Okay, it’s a good point! Francis: Okay, and so I’m going to end with asking you how viewers can help. So you said you’ve got an official release in January. Is that something that people can try out and contribute code to already? Benjamin: Yes, of course. There are many ways to contribute. First, feedback. Feedback is very interesting, as we consider it very valuable material because it gives us some hints about our priorities. And the whole source code is open source; everything is on GitHub, so it’s easy to deploy your Cozy and to start developing your own app, and we would be happy to help people to develop an app and to improve the platform so that their app can fulfill their expectations. Francis: Okay, so developers should install it and try making an app. And people who aren’t developers, they can use it and give you feedback. And can they help out — is there a way of contributing financially as well yet? Or is that not. . . it’s paying. Benjamin: It’s possible. We have a paying offer which is really to try to see how many people are interested and what they are interested in. And people who are not developers can have their own account. There’s a mailing list and you can subscribe to the mailing list, and if you send some good hints about what we could do, then we offer a few months free to host your Cozy. Francis: Oh, great! That’s fantastic. Thank you very much for talking to us, and I look forward to seeing Cozy running on lots of different ISPs and lots of people using it, and lots of contributions. Good luck!